Deep Silver's latest Saints Row 4 DLC will leave you brimming with holiday cheer. Apparently, the folks at Deep Silver are feeling particularly festive right now, because they're really lathering on the holiday cheer. Today, the publisher announced that Saints Row IV will receive a holiday-themed content pack, which will hit the market on December 11th. That should give you plenty of time to update your Christmas list. "Santa is trapped inside the simulation, but the Scrooge-like boss of the Third Street Saints can't muster enough festive spirit to save him. Can the Saints help the boss discover the true meaning of the season in time? A holiday classic for the whole family." 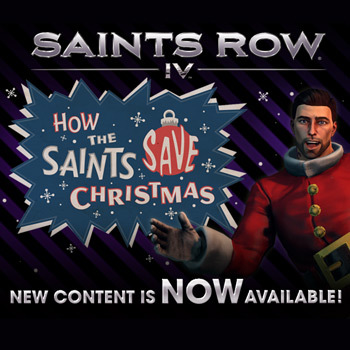 If you've purchased the Saints Row IV Season Pass, "How the Saints Save Christmas" is a freebee. If not, though, the DLC will drain $6.99 from your bank account. Deep Silver is also giving players the chance to sing their way to a Saints Row prize pack. To participate, simply record a video of yourself while singing a Saints Row-Themed edition of Jingle Bells (all of the lyrics are available on the contest's website). After you've submitted the video, Deep Silver will select several winners. This might be your only chance to win a prize by singing a song about Santa's kidnapping. So, don't waste it.